A large demonstration against German Chancellor Angela Merkel’s refugee policies has been held in the German capital of Berlin, with protesters shouting “Merkel must go!” A counter-rally has also been staged in the city. Hundreds of people gathered for a right-wing rally at Berlin’s central railway station demanding that Angela Merkel step down. The crowd was waving German national flags, as well as the flags of the German empire and those of the German anti-Nazi resistance movement from World War II. Speakers at the rally addressed the protesters, demanding that Merkel introduce a cap on new arrivals and implement tougher security measures. 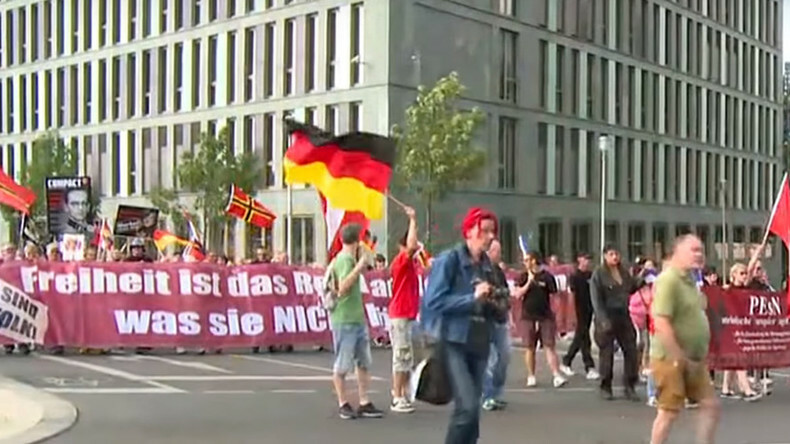 “Merkel destroys Germany,” one protester told RT correspondent at the scene. “It is not acceptable that we let people in our country without correct checks. We have a situation with people arriving and it is unclear what their intensions are,” another protester said. The anti-Merkel rally was organized by an activist group called “We are for Berlin, we are for Germany” to express discontent with the Chancellor’s open door migration policy. It is the third such rally organized by this group. Two others were held in March and May, German media report. About 1,350 people took part in the demonstration, according to police. Derzeit laufen vor ca. 1350 Zuhörern die Redebeiträge zur Kundgebung "Merkel muss weg". About 1,000 people took part in the counter-rally, according to the German media. Some 1,700 officers were deployed at the sites of the demonstrations to keep the rallies separated and prevent possible clashes between their participants, but both rallies ended peacefully and without incident, according to police. Merkel has faced mounting criticism since she recently reiterated that she will stick to her open door policy for refugees, maintaining that Germany is still “safe,” despite the recent deadly attacks there, most of which were committed by migrants. Her reaffirmation has provoked massive public outrage on social media. Germany has seen five deadly assaults in just over a week. Three were committed by asylum seekers, two of whom are being investigated for links to Islamic State (IS, formerly ISSI/ISIL).